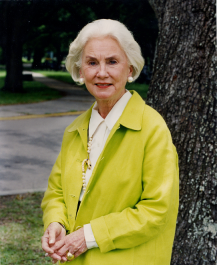 Genevieve “Gen” Trimble is the owner of Afton Villa, a two hundred fifty-acre plantation in St. Francisville, Louisiana. After the destruction of the forty-room, Gothic Revival mansion by fire in 1963, the plantation’s fine nineteenth-century garden languished until Gen and her husband Morell – “Bud” – bought the property in 1972 to save it from imminent subdivision and development. With advice from Dr. Neil Odenwald, FASLA, professor of landscape architecture at nearby Louisiana State University, the Trimbles elected to add their own influence to the garden. It reflects their lives and her strong sense of garden design, yet its origins, existing plant materials, and historic evolution are respected. As Trimble has noted, “All old gardens are haunted, one quickly discovers, in that their former owners who have loved and worked them seem forever in the shadows, possessively prescribing and dictating what not to tamper with or change.” Afton Villa Gardens are now open to the public. To take a virtual tour of Afton Villa, go to www.aftonvilla.com.